Comfort and durability in a compact, precise, go-anywhere handheld stapler. Soft grip materials and modern handheld design for comfort and precision stapling control. All-metal stapling mechanism for reliable and consistent long-term performance. Integrated safety loop for security cable application in high-traffic environments. Staples 2 - 20 sheets of 20 lb. paper with S.F. 3 Premium Staples. Easy to use and stands up nicely! Can't believe that not a single person has reviewed this product before. I purchased one of these 19 years ago, and it has worked like a champ - day in and day out in an office setting all these years with minimum problems. It is a nice handheld design with the rubberized surface feeling warm/soft in your hand. it is "light duty" in the sense that it works best with less than 10 pages at a time, and only holds about half of a "stick" of staples at a time, and does have a tendency to jam on its last staple or two, but honestly, how many office supply items last nearly 20 years! I was heartbroken when it finally broke, but elated when I discovered Swingline is still making these, and that Office Depot still carries it! Consistent comfort of use along with reliability makes this my favorite office tool. More importantly, the Swingline Soft Grip allows my arthritic hands the comfort needed. Welcome to MyBinding video. 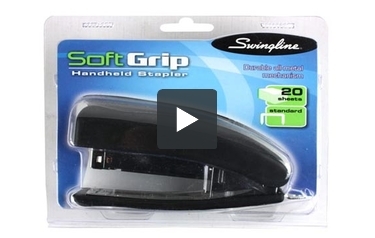 This is the Soft Grip Hand Stapler by Swingline. It's compact, going anywhere you need to go, and it's comfortable to last you the whole day. It can staple up to 20 sheets of 20lb paper and it has a throat depth of a little over two inches. It has a rubberized grip on the bottom and the top, and fits comfortably in the palm of your hand. A safety loop on the end allows you to tie it down in higher traffic environments. Refilling is standard; lift the top, lay the staples in, close it up, give it a tap, and you're on your way. That's Swingline's Soft Grip. For more demos, reviews, and how-tos, check out MyBinding.com. Have you been looking for a compact stapler that will feel good in your hand? If so, one you should take a look at is the Swingline Soft-Grip Hand Stapler. This is a product that's great if you want an easy-to-use device that can staple your documents. It does have some limitations, however. To learn about this item, read the following lists of its strengths and weaknesses. The Swingline Soft-Grip is capable of stapling up to 20 sheets of paper. This is a very common stapling capacity for a desk stapler and it will be good for short documents. This device is compatible with Swingline S.F. 3 premium staples. These staples are very easy to find and they're not that expensive either. The Swingline Soft-Grip has a safety loop you can use to secure the device. This feature will come in handy if you use this stapler in a high-traffic environment such as a checkout line. One of the best things about this device is that it's soft to the touch. The item has soft surfaces to make using it a comfortable experience even if you're stapling a lot of documents in a short period of time. This stapler can lay flat or else it can stand up on one end. This is convenient because it can reduce the amount of space it will take up on your desk. Also, having it stand up will make it easy to grab when you're ready to use it. The Swingline Soft-Grip is quite compact so you could even take it on-the-go with you, if necessary. This product is affordably priced so it won't put a dent in your budget. Also, it comes with a limited lifetime warranty so you can sure that Swingline really believes in this product. The 20-sheet stapling capacity won't cut it if your documents are very long. If you need to fasten those kinds of things together, you should probably go with a high-capacity stapler instead. The Swingline Soft-Grip can only be loaded with a half-strip of staples. A typical strip has 210 staples so you can only use 105 with this device. Since this is a small stapler its throat isn't very deep at all. It's only 2.75" so you won't be able to do any center stapling with it. The Swinline Soft-Grip is a bit of a mixed bag although its strengths do outnumber its weaknesses. The 20-page stapling capacity will be fine for shorter documents but it won't do for longer ones. It's great that this product is small so it won't take up much room but that also means you can't use it for center stapling. However, you will definitely love how this device feels and that it will be comfortable to use even when you're working with a tall stack of papers. It also has a great warranty and it's reasonably priced. So long as you're okay with this product's limitations, you're probably going to love this stapler. Be sure to check out the Swingline Soft-Grip today if you need a stapler.